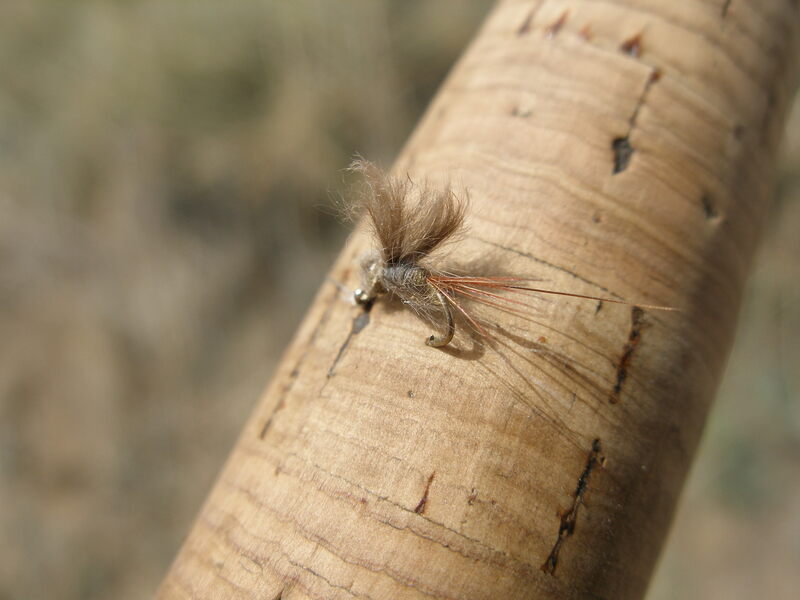 The Royal Gorge Angler report stated that the cold weather slowed the progression of the caddis hatch, and it was projected to be in the Salida area for the weekend. I passed on fishing Saturday due to unsettled weather and decided to give it a try on Sunday. With our new house on the north side of Denver, I checked the map, and it appeared to be closer from Stapleton to Salida via US 285 compared to going through Colorado Springs. 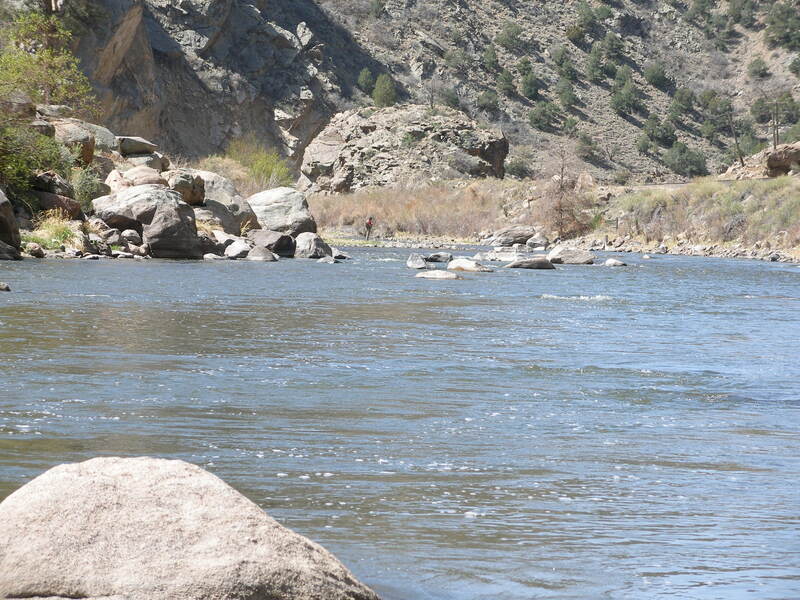 The Springs route was my normal choice from Castle Rock or to access the lower Arkansas near Canon City. Also, there was much road construction on the north side of Colorado Springs, so I hoped to avoid this potential delay. I left early, around 6:15AM and arrived at the river by 9AM. There was already a car in the pullout with three fishermen charging down the bank. I watched them, and when I was ready, I hiked down US 50 a ways to the point, where I can normally cross the river and fish around an island. I descended to the river and fished up from a large rock wall with no luck. I rigged up with a strike indicator, split shot, double bead caddis (Scott Sanchez book), and an emerald caddis pupa. Since there were fishermen above me, I decided to try and cross to the island, and then work down the far channel. But I progressed one-third of the way across and realized it was too risky and retreated. I then decided to reascend to the highway and continued down river below the large rock wall below me and the island to see whether a different crossing point emerged. Unfortunately there was no place to cross, so I fished back up to the rock wall. Along the way I had some significant tangles and tree hookups. I was quite frustrated and feeling like I hardly fished, when I approached the downside to the run along the rock wall. 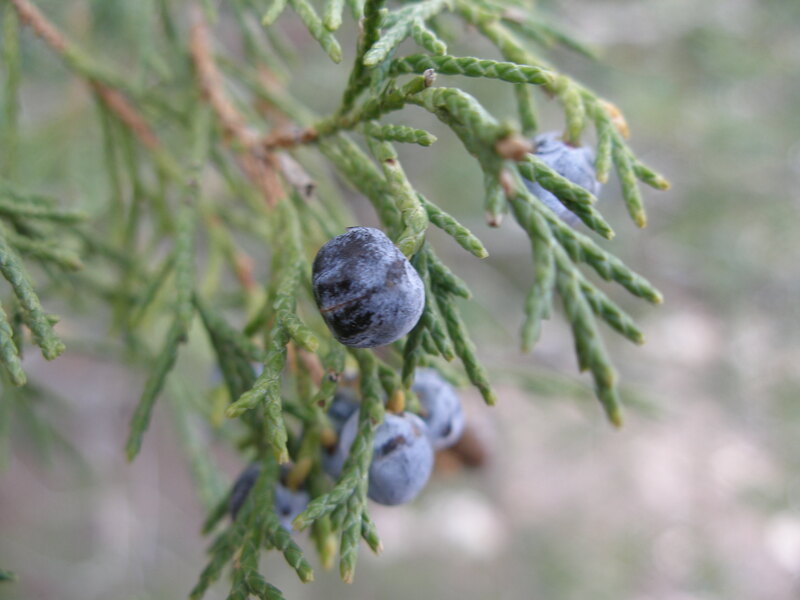 I waded up around eight feet out to the head of the run, and I began to swing casts through the area. On one of the swings away from the wall I felt a tug and hooked up with the beautiful rainbow that is pictured in the associated photo album. 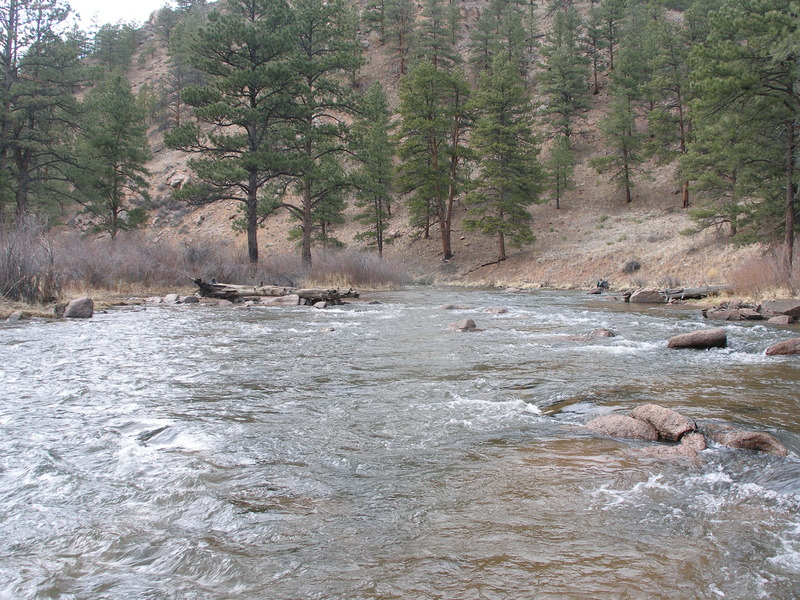 Next I fished along the left bank of a long pool/riffle above the island, since the fishermen on my side moved on. 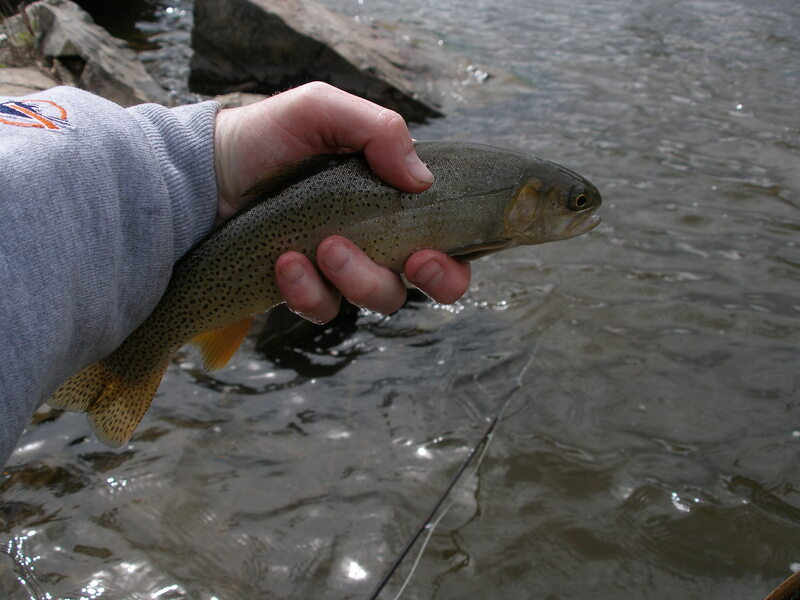 I caught one small rainbow, and by 11AM, while one-third of the way up the long run, I decided to head back to the car and eat lunch early in case the caddis hatch occurred. Large numbers of caddis occupied the bushes and rocks, so I felt it was unlikely there would be an emergence. After lunch, I returned to the spot where I ended, but I grew tired of nymphing, and decided to tie on a caddis dry. 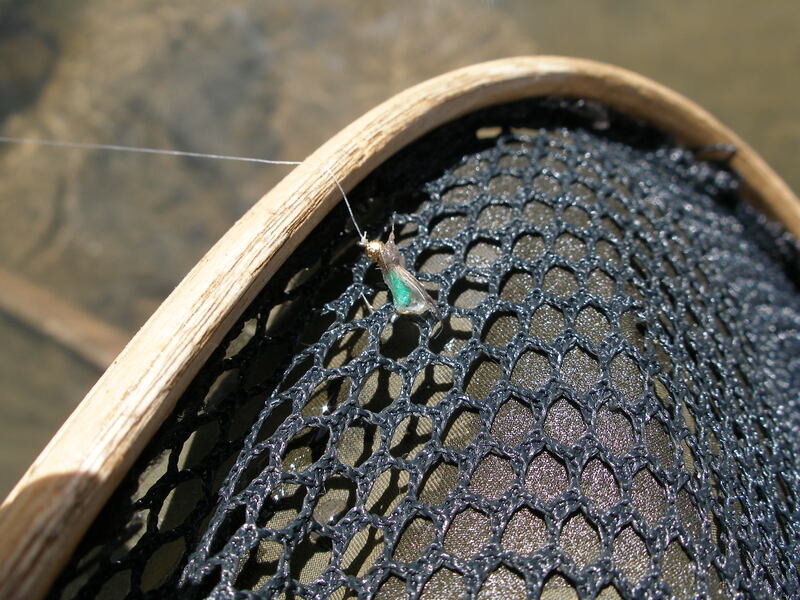 Perhaps fish along the edge in fairly shallow lies would be opportunistic and pounce on the caddis. The tactic did not produce, so after giving it a good try, I switched back to nymphs, and this time I tested a beadhead prince on top and beadhead hares ear on the end. I caught a fish on this combo and then eventually moved the beadhead hares ear to the top and tied on a size 18 grey sparkle caddis pupa that I produced a long time ago. It was the only one I had, but I caught several fish on the classic fly. I caught at least two while just holding the flies dangling below me (on purpose, not by luck as I’ve sometimes experienced). All this time there were strong gusts of wind, and several times I needed to stand sideways and hold my hat. 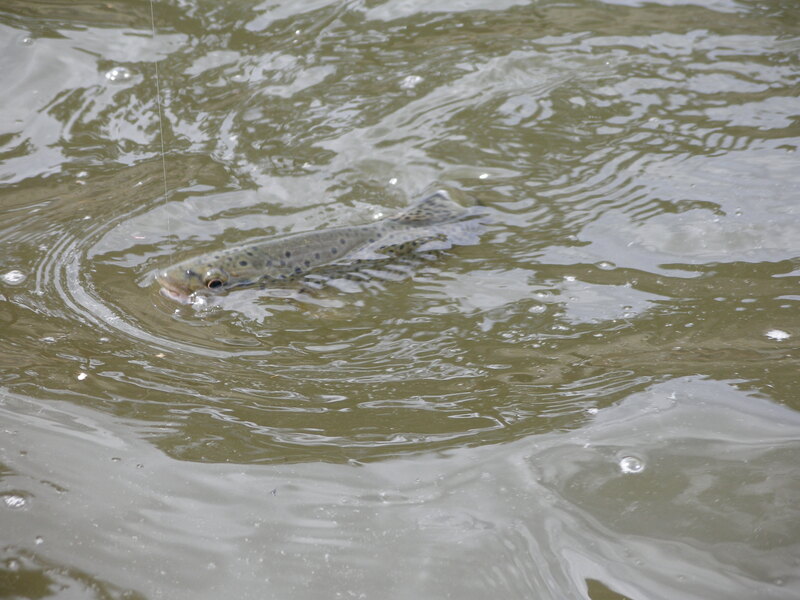 Around 3PM the wind subsided and caddis started dancing and dapping on the water. 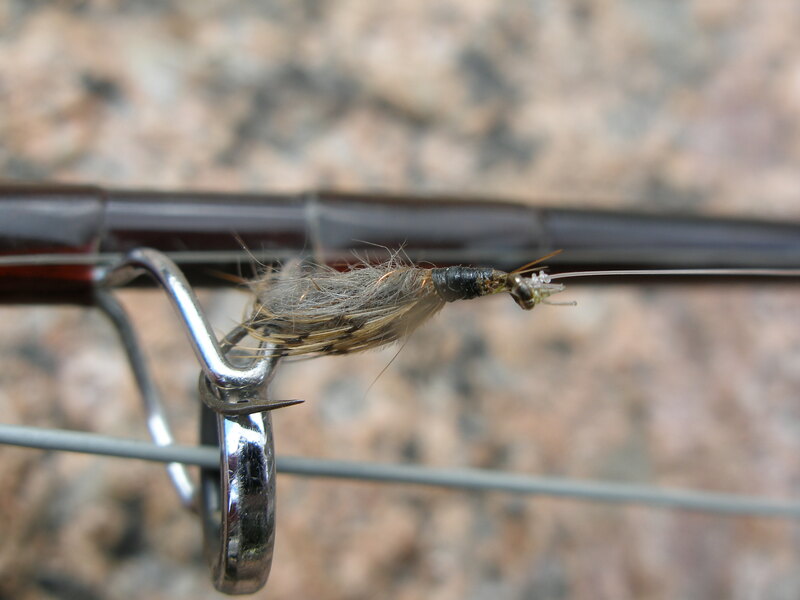 I spotted several sporadic rises, so I changed to a deer hair caddis dry. I started fishing where I spotted sporadic rises, and I was able to pick up another six fish. One of these was a surprise cutthroat. I caught some by prospecting in likely spots in addition to casting to observed rises. The last one I landed, a nice brown that I photographed, actually took the dry, when it sank at the end of its drift in front of a rock. When this happened, I thought the fish were tuned into egg laying adults, so I experimented with a prince nymph, which usually works in this situation, but it did not tempt any fish, so I decided to call it a day. 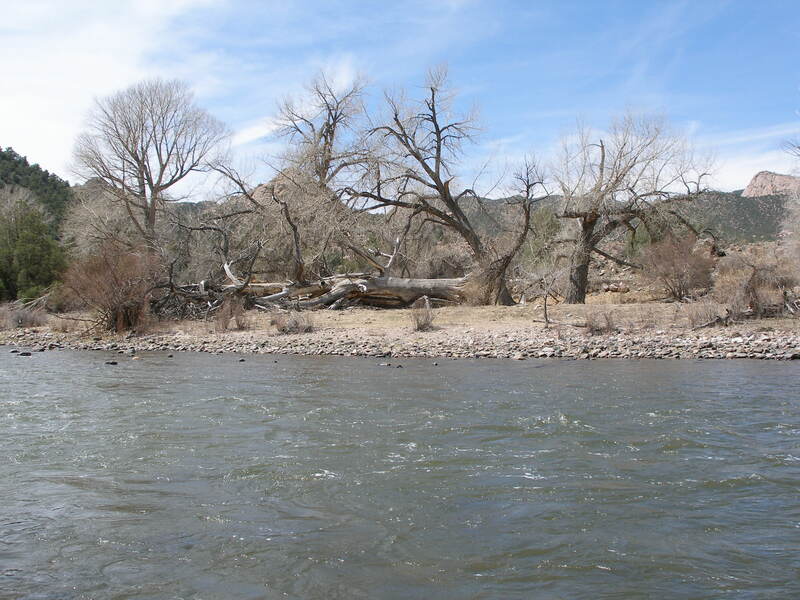 I got an early start in anticipation of crowds, as the Royal Gorge Angler report stated hatching began on the lower river around Canon City. 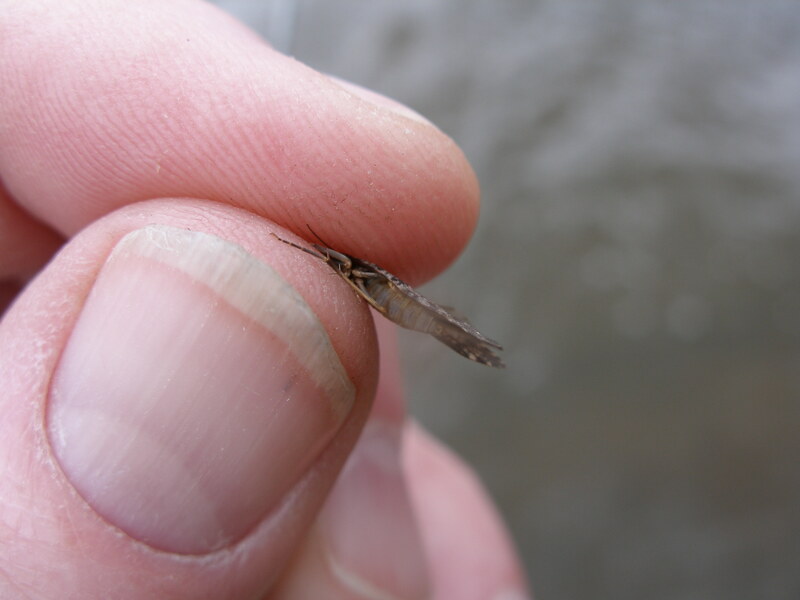 I was cognizant that off days were not an option during the coming week, so I concluded that this was my only chance to meet the heavy spring caddis hatch on the Arkansas River. I parked slightly downstream from the Pinnacle Rock access area in the canyon section between Royal Gorge and Texas Creek The report suggested using caddis pupa until surface activity appeared, so I rigged a strike indicator, split shot and beadhead hares ear trailing a beadhead emerald caddis pupa. 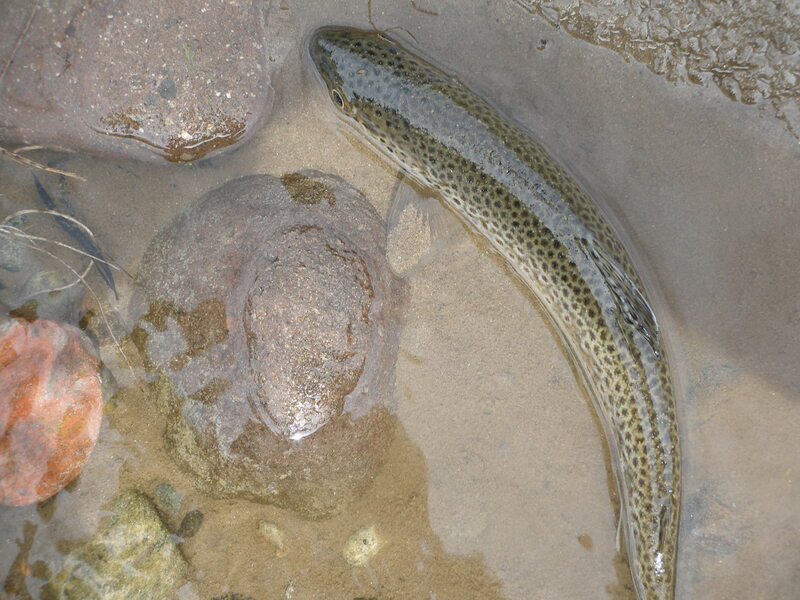 Initially action was absent, but when I approached a rocky wide stretch near Pinnacle Rock, I began to land fish. There was a gentleman fishing a pocket behind a rock above me, so I crossed over to the far bank and continued working upstream. 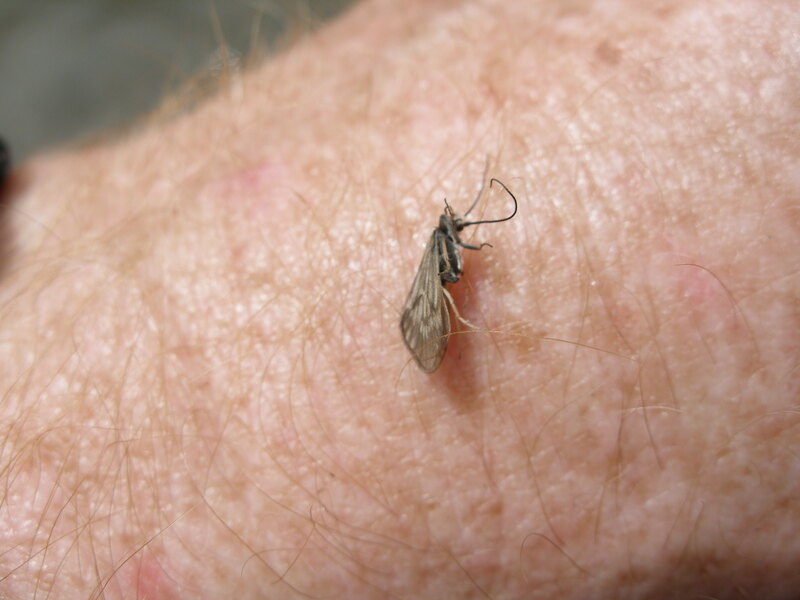 I was catching trout mostly on the swing, with around 80% going for the pupa and 20% on the hares ear. I noticed more fishermen above Pinnacle Rock, and it was 11:30, so I headed back to the car for lunch. 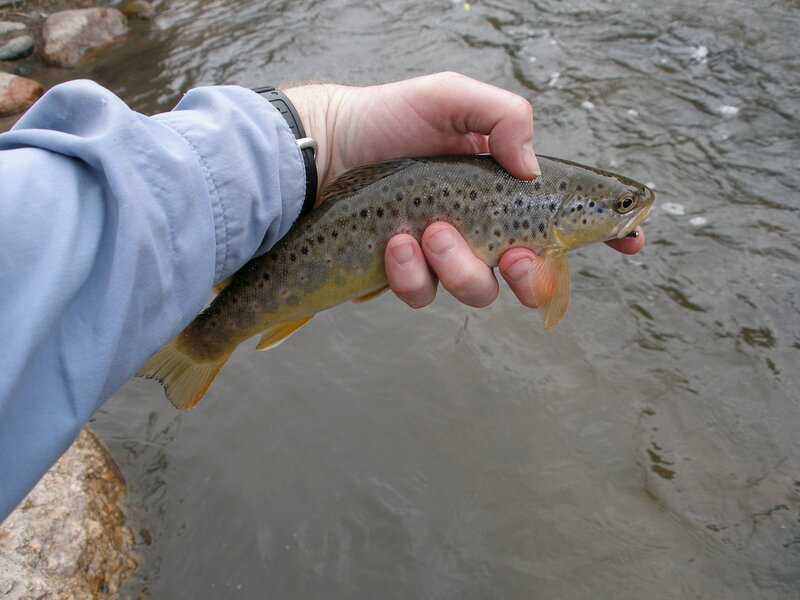 I netted 10 browns by this time, and all were twelve inches or smaller. I ate my lunch overlooking the river on a high bank and watched a couple guys who waded into their waists, as they flailed the water. I took a couple photos of them, and then gathered my stuff and hiked back to where I ended the morning and resumed my upstream progression. Once again, because of other fishermen on the roadside bank, I crossed over to the far shore and hiked the railroad tracks for a while to get above a fisherman. 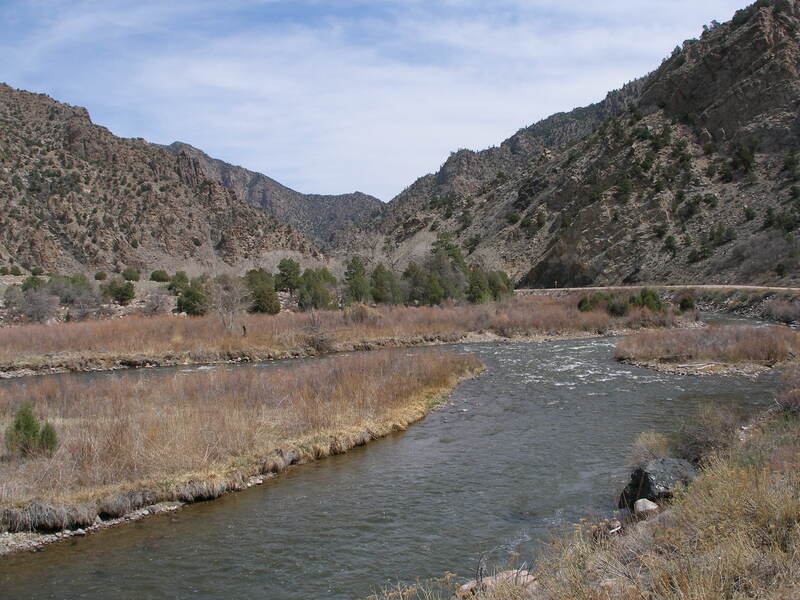 In a stretch where the canyon narrowed along with the river, I landed two trout by stripping the pupa upstream along the bank streamer style. Generating strikes was more difficult, and extra searching and movement were required to entice fish. But I persisted and caught several on the swing in the wide tail next to where I typically park to fish the braided section above Pinnacle Rock. I encountered some geese in this area, and then I moved up to the braided section and proceeded to fish the extreme right channel. Because the river splits, these channels carry less volume, so I switched over to my favorite technique of using a large attractor with a nymph dropper. I tied on a Chernobyl ant trailing a beadhead prince in case egg laying adults made their presence known. I worked the channel thoroughly all the way up to where it split from the main stem and caught four trout in the process. One was probably the biggest of the day, but not much more than 12 inches. One of the four surfaced and inhaled the Chernobyl. I ended up the day with 20-25 trout landed. I was disappointed that I did not meet the heavy dry fly action, but it was a good day nevetheless. See photos. Rather cryptic report in 2006! 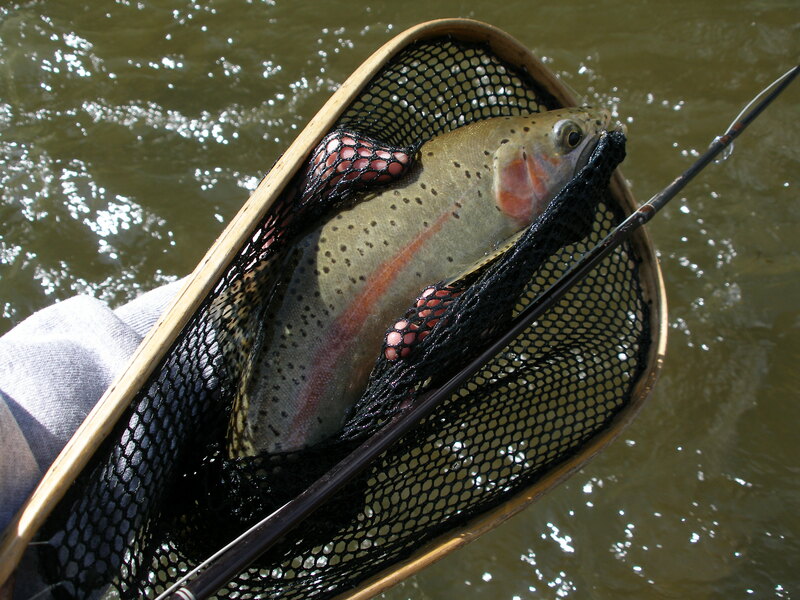 I caught three rainbows in some early season action on the South Platte in the Deckers area.